What were the conditions in Germany which led to another world war only twenty years after the War to End All Wars? How did a “civilized” nation allow its leaders to annihilate so many of its own citizens? And how did such evil leaders gain power in the first place? 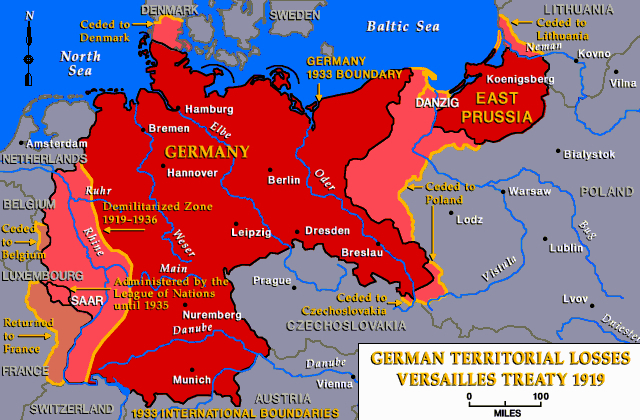 The Treaty of Versailles – as one of the conditions of surrender, Germany was forced to pay huge reparation payments to the countries she fought during WWI. She also lost territory and was forced to surrender her colonies abroad, further limiting the income needed to pay debts and recover from the War. To help pay her debts, the German government printed more money, which led to extreme inflation. Courtesy of "Today in Social Sciences"
Enter ➥ numerous political parties vying to fix Germany’s troubles, parties that opposed the new government (Weimar Republic) and hated democracy. The German Army hired former WWI soldiers to infiltrate and spy on these groups. One of these soldiers, Adolph Hitler, became an undercover agent and joined the German Workers’ Party in 1920. He liked the party’s program, so he dumped his role as spy and soon became the leader, renaming the party the National Socialist German Workers Party, or Nazis. Hitler led the Nazi Party in a failed attempt to take over the Bavarian state government in 1923 and spent a year in prison. After his release, he built support for his party by recruiting from other discontented groups. 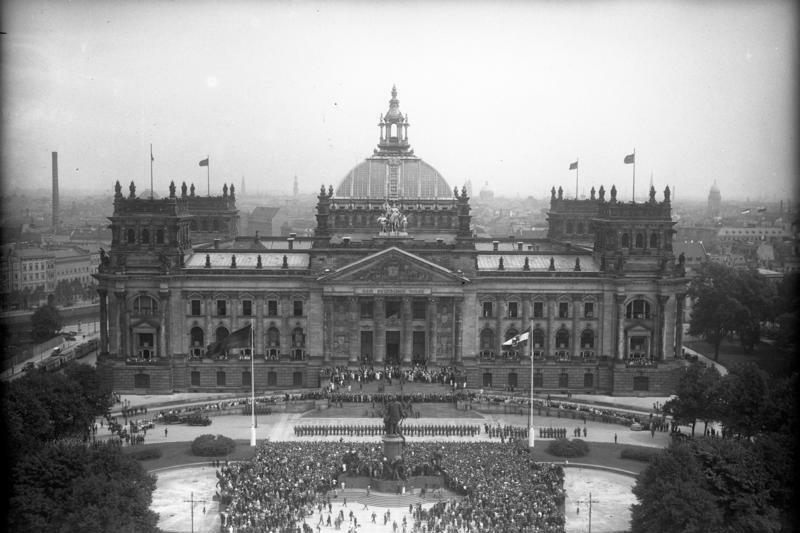 1928 elections – the Nazis had 800,000 votes (2.6%) for representatives in the Reichstag (German Parliament). 1929 Wall St. Crash – American banks called in German loans, causing German businesses and banks to fold and unemployment to spin out-of-control. 1930 elections – the Nazis had 6.4 million votes for representatives in the Reichstag. The centrist German government was unable to cure the economic problems and parliament was paralyzed by the two large opposing blocks of Nazis and Communists. July, 1932 elections – the Nazis received 13.7 million votes (37.3% of the vote) and became the second largest party in the Reichstag. 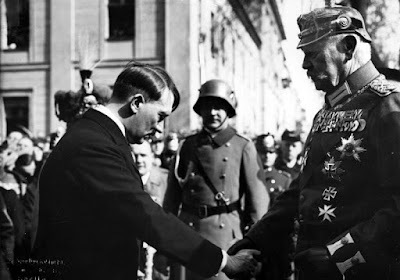 Hitler used his growing power to demand the position of chancellor, but President Hindenburg resisted. September, 1932 elections – the Nazis received 11.7 million votes, and President Hindenburg offered Hitler the post of chancellor, which he accepted on January 30, 1933. The Nazi celebrations included torchlight parades and the assaulting of their political opponents. 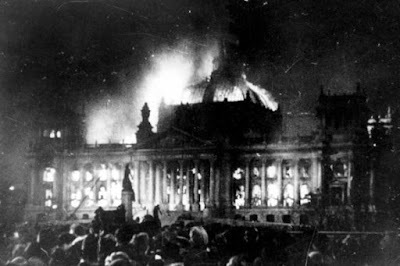 Burning of the Reichstag Building. Courtesy of World Future Fund. February, 1933 - an arsonist set fire to the Reichstag building, and Hitler convinced President Hindenburg to issue a decree (allowed by the Weimar Constitution), suspending most civil liberties in Germany. These rights (secrecy of the post and telephone; habeas corpus; freedom of the press, of expression, of free association, of public assembly) were not reinstated as long as the Nazis held power. Because the Reichstag arsonist was a communist, Hitler declared that the communists were plotting to take over the government. Many communists were arrested, including those serving in the parliament. March, 1933 elections - the Nazis received 44% of the vote. By forming an alliance with another party which had received 8% of the vote, the Nazis now had a majority in the Reichstag (52%). In order to pass the Enabling Act, the Nazis either arrested or intimidated representatives of the Social Democratic Party who opposed them. The act passed, giving Hitler the right to rule by decree, and he effectively became the dictator of Germany. The Nazis immediately embarked on a plan to exclude the Jewish population from German culture, politics, economics, and society. After WWI, approximately 600,00 Jews lived in Germany (under 1% of the population). One third lived in Berlin (4% of the Berlin population). Seventy percent of Jews lived in large cities while 50% of the non-Jewish population lived in small towns and villages. In 1933, only one in five Jews lived in small towns. During this period, 75% of all Jews were employed in trade, commerce, the financial sector, and the professions (three times the proportion among the general population). Jews owned 80% of the turnover of all German department stores, 25% of smaller retail outlets, and 30% of clothing stores. They handled 25% of all wholesale agricultural trade, and in some districts, largely controlled cattle dealing and grain marketing. Only 11% of all doctors and 16% of all lawyers in Germany were Jewish, but they were concentrated in Berlin, giving the appearance of a much higher percentage. Several of the great publishing houses were owned by Jews, and they were highly represented among writers and journalists, in theater and the film industry. However, a significant number were rather poor. In 1932, during the Great Depression, over 31.5% of Jewish employees in Berlin were out of work, and one in four received charity. Jews from Poland and Russia had immigrated to Germany during the 1880's to the 1920's, and by 1933, they made up 20% of all German Jewry. The Eastern Jews were predominately small merchants, itinerant traders, shopkeepers, tailors, artisans, and industrial workers. Many were Orthodox and religiously observant whereas the majority of German Jews belonged to the Reform or Liberal movement. Also, many German Jews were assimilating and marrying outside the faith. On March 1st, we'll explore the escalating actions of the Nazis, leading up to the rescue of over 10,000 children through the kindertransports immediately prior to the outbreak of WWII. 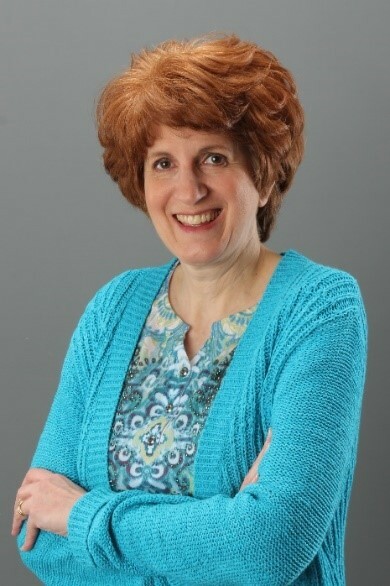 Cindy Stewart, a high school history and language arts teacher, church pianist, and inspirational historical fiction author, was the historical category winner for ACFW’s 2014 First Impressions writing contest. Cindy is passionate about revealing God’s handiwork in history. She resides in North Georgia with her college sweetheart and husband of thirty-five years and near her married daughter, son-in-law, and three adorable grandchildren. She’s currently writing a fiction series set in WWII Europe. These days and WWI and WWII are dark days in our history. I remember my grandparents never liked to talk about WWI and all that happened, and I also remember my maternal grandfather who is of German descent saying that no good would ever come from anything Hitler said or did. He called him an evil man of Satan. Thank you for sharing, Martha. I know the time period of the world wars was extremely difficult for those who lived through it. I so hope we will continue to learn from the mistakes of the past and not repeat them. Thank you for sharing. I look forward to reading more. Such a sad, dark time in history. Thank you for responding, Debbie. Yes, so many were affected by the schemes of a relatively small group of evil men. Take a closer look at this blog on trackingapps.org, for some information about phone monitoring applications.